Mid-Autumn Festival (Tet Trung Thu) is just around the corner and I have mooncakes on the brain. For those not familiar with mooncakes, they are the baked delicacy for the Mid-Autumn Festival. These delicious cakes come in a variety of different shapes and sizes but what they have in common are rich, dense fillings wrapped in a thin, tender pastry dough stamped with intricate patterns and then baked to a lovely honey color. You can’t miss these around this time of the year because they are everywhere. Because they are time-consuming to make and require special molds or stamps, most people find it convenient to just buy them. The truth is mooncakes are really easy to make and much more rewarding to give to family and friends when they are homemade. This year instead of making the traditional mooncakes, I decided to do something different and fun and make my mooncakes into the shape of pigs. These cute little piggy mooncakes are pretty easy to make provided you have a little bit of patience and some time. What I really loved about making these is that no two piggy looks the same. When you’re done you’ll have a plateful of adorable little pigs staring back at you and they will make you smile. They’re almost too cute to eat! Instead of making the syrup from scratch–very time consuming and difficult to get right, I use a breakfast syrup with molasses. Any variety will work provided it’s nice and thick. I also like Lyle’s Golden Syrup which is meant for baking and cooking. It has a really nice distinct flavor. You can vary the filling. This recipe uses lotus seed but you can use mung bean (see my Shortcut for Cooking Mung Bean), red bean, taro root, etc. Boil the filling until soft (as I show in the video), add sugar and puree. Then, cook the filling in a pan until a soft dough forms and roll into balls. From here, the recipe is the same. Lotus seeds are generally very hard once dried. If you have the time, I would recommend soaking for an hour or so before cooking. Also, if you see any green stems in your lotus seeds, be sure to discard them. These stem are really bitter and will ruin the filling. When wrapping the dough around the filling ball, if you get air bubbles, pop them with a toothpick and then smooth out the dough. 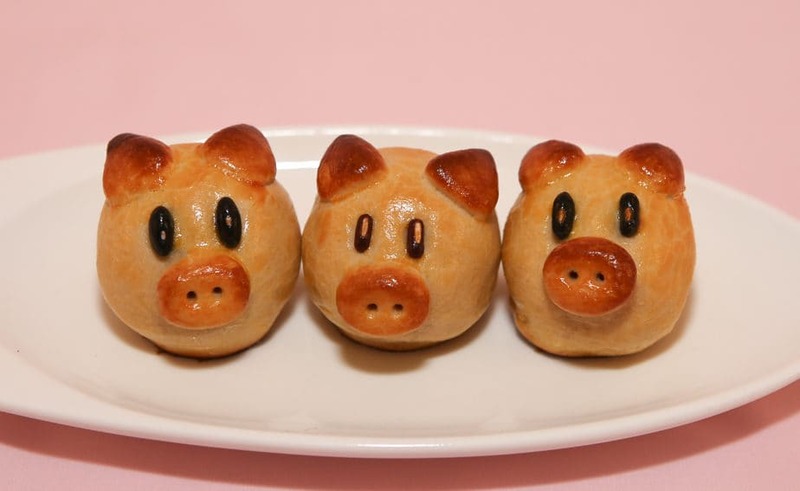 If you leave the air pockets, your pigs will have bubbly lopsided faces once they’re baked. I use beans for the eyes because they don’t melt. I’ve tried chocolates and other candies and they all melted so my pigs looked like they were crying. The beans hold-up really well in the oven, are the right size and easy enough to find at any store. If you have small enough fingers, you can try using sesame seeds for the eyes. When you pop the cakes into the oven for the last time at 425 degrees, bake for no more than 5-6 minutes. It may seem like they’re not brown enough but they are. Resist the urge to bake them longer because they will burn. The ears and nose brown up quickly and you don’t want to burn them after all of your efforts. The cakes will continue browning after you’ve removed them from the oven. The mooncakes are not to be eaten right away. If you can’t resist and must have one immediately, you’ll notice the cake is crusty and crunchy–this is not the intended texture. Instead, store the cakes in an air-tight container for at least a day to allow them to soften so they are more cake-like. So resist the urge to devour these delicious mooncakes. Store them for a day and you’ll be amazed at how soft and moist they are the next day. Scoop out cooked lotus seeds using a slotted spoon being careful not to transfer the liquid and place in a medium bowl. Add sugar and vanilla sugar and combine well. Use a food processor or blender to puree the lotus seeds until they are smooth and creamy. Spoon filling into a pan. Add the peanut oil to the filling. Cook the pureed lotus seed over Low heat stirring constantly. Initially the filling is soft, wet and spreadable. After 5-7 minutes the filling dries out and starts to pull away from the pan. After another 3-4 minutes the filling sticks together resembling a dough. (Total cooking time is approximately 10 minutes.) Remove from the heat and allow to cool until it can be handled. Roll into 12-1 oz size balls. Cover with plastic wrap until ready to use. Sift together the all-purpose flour and cake flour. In a small bowl or cup add the syrup, peanut oil and egg yolk. Mix together until evenly blended. Make a well in the flour and pour in the syrup mixture. Using a fork, combine the flour and syrup mixture together by stirring in circles from the edge of the bowl to the center. Continue stirring until all the dry flour is worked into the dough. After a minute or so, a soft dough forms. Gently knead the dough a few times with your hands. Don’t overwork the dough. Wrap in plastic wrap and allow to rest for 30 minutes. Position oven rack in the middle of the oven. Preheat oven to 375 degrees F.
Using a rolling pin, flatten 1/2 oz of dough into 3-inch circle. Place a filling ball in the center and then gently work the dough around the filling covering it completely. Pinch the dough together to seal the edges. Roll between your palms until smooth. Use a toothpick to make a few holes on the underside of the cake to allow the steam to escape when baking. Use a small spoon to make indentations for the eyes. Drop in the beans for the piggy’s eyes. Take a small amount of dough and roll into an oval shape to make the pig’s nose and position just below the eyes. Take pea-sized amounts of dough and form into triangles for the ears. Affix the ears to the pig’s head. Gently flatten the ears against the piggy’s head. Use a round toothpick to make 2 nostrils for the pig. Make 6 pigs at a time. Remove any bubbling in the dough by pricking with a toothpick. Use a small pastry brush to brush off any excess flour. To make the egg wash, combine the egg yolk, water and sesame oil. Stir and then strain the mixture. Set aside for now. Remove cakes from oven and allow to cool for 5 minutes. Spritz each cake with water. Brush the egg wash on each pig coating it evenly. Increase the oven temperature to 425 degrees Fahrenheit. Return the cakes to oven and bake for another 5-6 minutes. Remove from oven and allow to cool. Store in an air-tight container. Enjoy the following day. Hi, if we use beans as eyes, wun it b too hard or uncooked to eat? Dun we need to remove it when eating? Your piggies are the cutest. Too cute to be eaten! I will definitely try to make them like you, w/o the press. Regarding the syrup used for the dough, can I use any other syrup? I am not familiar with the one you suggested (Lyle’s golden syrup). Thanks. Yes, any breakfast/pancake syrup you like would work for making the dough. Have fun making the piggy mooncakes! I have a piggy press…. is this the same recipe for the presses if not, do you have another recipe for a moon cake press? Thanks! Was the dough dry when made the cakes? It should be moist as I showed in the video. You can add more oil to the dough and this will help the cakes be softer. Give it another try chi! Hi there! Can I make these piggy with snow skin? By the way, your video was very good! Thanks! I’ve made little piggies with snow skin and they are super cute. I colored the dough pink and then shaped them the same way. I used little candies for the eyes and added a curly tail. Although a bit sticky the snow skin is very pliable. I’d love to see a pic if you make them. Good Luck! I love this recipe! My daughter and I had such a great time creating the little piggies together. Not only it was fun but also tasted great. Thank you for sharing with us. Btw, some of our piggies cracked when baking. Can you tell us what we did wrong? I am glad to hear you and your girls enjoyed the recipe. They are super cute and so much fun to make! Regarding the cracking, if the piggies were cracked after the initial bake, I would say the dough was a bit dry or perhaps your oven runs a little hotter than 375. If they cracked after the second bake I would recommend spritzing with a bit more water before the egg wash. The trick is to let the water soak into the cakes before applying the egg wash. Thanks for sharing your results! These are so adorable! I like all the slight variations in the pigs. You are very creative!